One of Jordan Brand’s new models this year is now available in a new colorway on the sneaker market. The Air Jordan Future hit the market in Volt/Volt-White colorway, which is simply listed as the “Volt” edition of this shoe. It sports a volt-based woven upper part along with a white midsole and translucent volt outsole. “The Jordan Future blends one of the most iconic designs with a one-piece woven upper to create an entirely new look. The deconstructed upper forgoes a heel counter and toe enforcer for a futuristic, minimalist style,” the shoe as described by Nike. 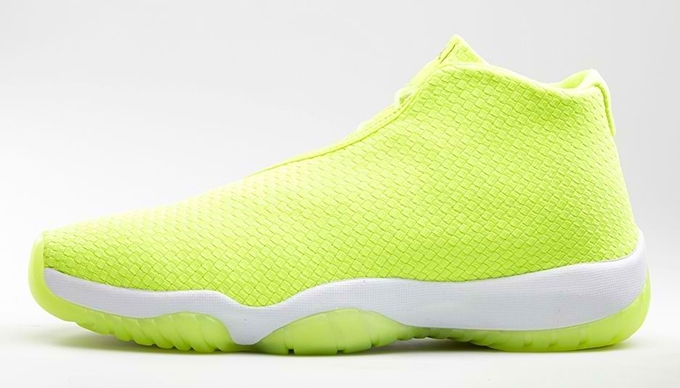 The Air Jordan Future “Volt” is available in select Jordan Brand accounts worldwide for $150 per pair.